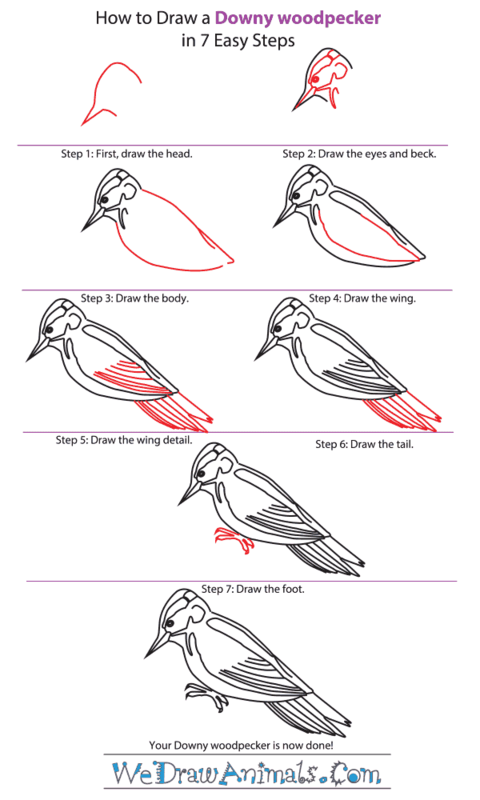 In this quick tutorial you'll learn how to draw a Downy Woodpecker in 7 easy steps - great for kids and novice artists. At the bottom you can read some interesting facts about the Downy Woodpecker. 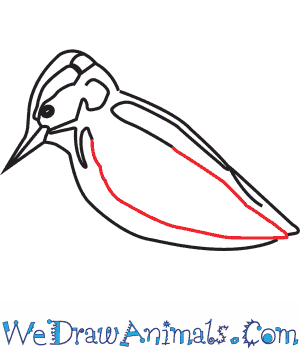 Step 1: To start the Downy Woodpecker, draw the head by making a curve line with a point sticking out the bottom left side for the beak, which is 3/4 of an inch long. They use the beak to make holes in dead trees for their home. 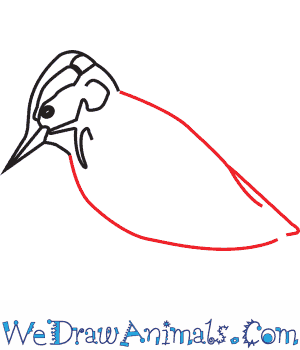 Step 2: Add the unique pattern on the head of the Woodpecker like in the picture shown. 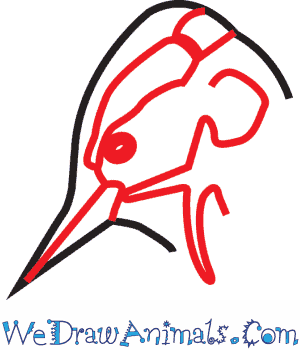 Don't forget a few small circles for the eye and a little line in the beak for the mouth! Step 3: For the body, draw a smooth curved line down the back. The add another curved arc along the bottom, and leave a very small space open at the very back. 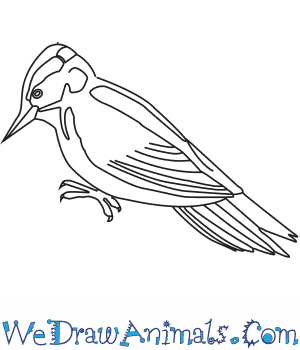 Step 4: Add the wing by drawing two more curved lines that meet at the end. Step 5: Now, add some lines inside the wing to make the wing detail. 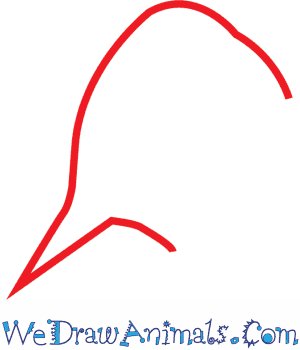 Step 6: Now, add the tail by drawing a few lines down that meet at rounded feather tips. Step 7: Draw a few pointy toes under the body with small lines. The Downy Woodpecker has four toes on each leg. You can leave the body of the Downy Woodpecker white. The very top of the head is red, and the wings and head have a black and white pattern along them. The Downy Woodpecker is a member of the bird family and the scientific term for them is Picoides pubescens. This is the smallest member of the Woodpecker relatives in North America, but they are bigger than the Piculets in South America. 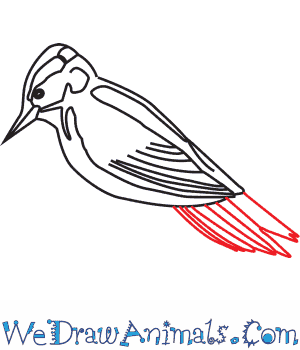 They have a white body with black wings and a black mask over the eyes, and a red crest on the head. They live in temperate North America and Central America. The animal was first documented in 1766. They can reach up to over .5 feet in length. The bird can have a wingspan of up to over 1 foot wide. This species weighs up to over 1 ounce. The beak is almost 3/4 of an inch long. These birds breed in forests with falling leaves, where they eat in abundance. The animal makes nests in holes of live and dead trees in the winter, since they are permanent residents and don’t migrate. This bird forages on insects, seeds, and berries. It is common to find them in urban areas, where they may nest in bird houses made by humans. There are not many of these creatures, but they are the least concern for a possibility of extinction.